We are back with our latest update. Once again, we would like to thank the Companists who have joined us; we are delighted and grateful for the investment and the trust you have placed in us. In addition to presenting a new product in the fresh food segment, we are celebrating our first supermarket chain customer in this update. Our sales strategy for 2018 calls for us to focus on the expansion in stationary retail on the one hand and list additional products in our online shop on the other. In addition to other food processors such as ice cream parlors, bakeries, granola bar manufacturers, restaurants, and offices, we have acquired our first supermarket chain with 680 potential stores as customers. The wait of the many requests for fresh produce from our KoRo-Community is finally over! We expanded our product range with the shop launch of KoRo Fresh. In recent weeks, we examined many fresh fruit and vegetable traders for our quality requirements and have found a strong partner who can guarantee quality and integrate our automated processes in the logistics and supply chain. The difference to ordinary fruit and vegetable boxes is the exotic variety and taste. Therefore, we have opted for premium fruit and vegetables from which star chefs draw their resources. Customers can now also order 4-5 kg fruit and vegetable boxes comprised of 1/3 exotic and 2/3 seasonal produce. The weekly boxes are presented on our Instagram channel KoRo_fresh, where you can gain exciting insights into the fruit and vegetable boxes. The boxes are delivered to customers by express delivery Tuesday through Friday to guarantee freshness. Of course, the customer can order the delivery around the clock or determine the time of delivery. The boxes are also available as a subscription. 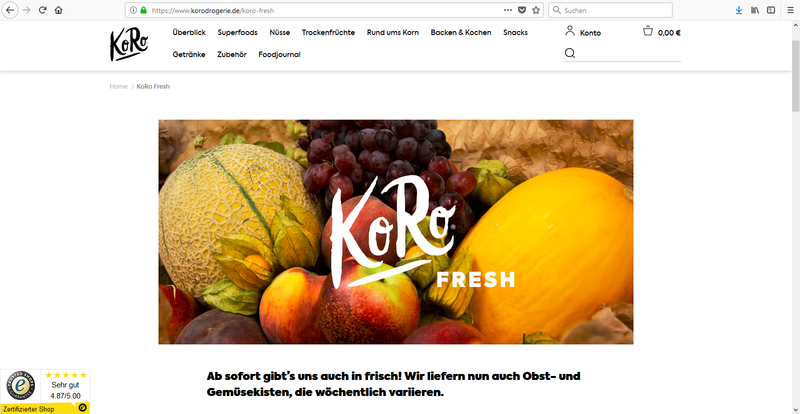 After a successful test phase with our fruit and vegetable boxes in the KoRo Fresh shop, we can source more fresh products and send more freshness to our customers' refrigerators. We are in the process of completing the final preparations and will use Instagram to announce the official launch. Please register in order to see the complete profile of KoRo.